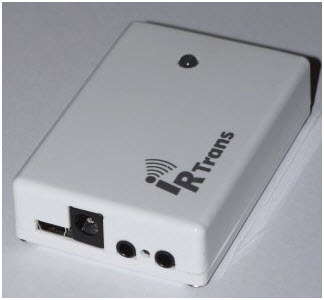 IR Trans WiFi DB by IR Trans is wireless Infrared Gateway Interface which transforms any system integrated with this unit into universal IR remote control with virtually limited possibilities. When integrated with iMCA System, you can not only remotely control almost any of your IR based remote control devices, but also create virtual connections with any other sensors registered in the iMCA System such as temperature, humidity, vibration, flood, air flow, PIR detectors, GAS detectors, etc. You can easily create and execute any number of automation scenarios based on time schedule or sensor information, without having to deal with any cryptic codes or learning a scripting language. Ideal for projects of any size where Infrared Remote control and switching is required. Sends and receives IR Codes. IEEE 802.11bgn WLAN Interface for integration into existing WLAN Networks. Socket for external IR Receiver (Can be used instead of the internal one). Optionally with Universal Learning IR receiver. Learns and measures ALL Carrier frequencies. Range: 1m.